25th Anniversary of the "Hesston Tornado"
Patrol Car 412: "412, Wichita. . ."
412: "412 ... I've got a tornado on the ground half a mile south of Castleton, and it's moving northeast." Radio: "O.K 412, tornado on the ground one-half mile south of Castleton . . . we'll advise Weather. Keep an eye on it." 412: "Wichita, I'm following a large tornado ... this is a large tornado." Trooper Bob Wilson's voice was calm and steady as he called in his report at 4:32 p.m. Tornadoes come with the territory on the Kansas Highway Patrol, but Wilson had never seen one in 16 years on the road. For years, he could only wonder what he would do if he saw a tornado, how he'd react. On this day, wonder would become terror. It was Tuesday, March 13, 1990, and tornadoes were sprouting by the dozen along a storm front that stretched from Nebraska to Texas. The Midwest was paying for several days of early 70-degree heat. As fate would have it, Trooper Wilson was sitting smack in the front of the storm cell that would produce the worst tornado of the day -- a monster cyclone of a type rarely seen, even in "Tornado Alley." The storm would stay on the ground for two hours, and at times, grow up to three-quarters of a mile wide. It had already been a busy day at the National Weather Service office in Wichita. The short staffed and battle-weary forecasting team was putting in its third straight day of overtime because of severe weather. Thunderstorm warnings had been going out since 10 a.m. It was now going on 4:15 p.m., and the main line of storms was finally moving in from Oklahoma. Randy Steadham, acting meteorologist-in-charge at "Wichita Weather," huddled close to the radarscope and watched one storm cell balloon and break away from the squall line south of Hutchinson. Steadham and his team decided to issue a severe thunderstorm warning for southern Reno County. Meanwhile, Trooper Wilson, who had heard a report of golfball-sized hail, found a blinding curtain of it as he headed south of Hutchinson on K-17. After a few miles, the hail suddenly stopped, giving Wilson a clear view of a pitch-black, anvil-shaped cloud about two or three miles away. Wilson pulled off the road at the north fork of the Ninnescah River and watched. "I saw two tails come out of that cloud...I'd say they came down about ten percent of the way and just hung there for a short time," says Wilson. Then the two tails merged at the very tips and became one as they touched down on the ground. That's when I grabbed my camera and jumped out of the car." Trooper Bob Wilson's black & white photos: Two tornadoes (left) merge into one large vortex. Back at Troop F Radio in Wichita, chief operator Charlie Steadman recognized the intensity in Bob Wilson's calm voice. Steadman was on the statewide closed-circuit emergency phone, relaying Wilson's reports on the twister's position directly to "Wichita Weather". Forecasters began putting out tornado warnings based on the information, and within minutes the warnings were clattering across the teletypes of radio and TV stations. Other patrol cars and agencies heard their information directly from their police scanners, as Troop F Radio operator Larry Zimmerman repeated traffic on the tornado's position. The tone of Bob Wilson's voice barely changed as he told Troop F the tornado was now half a mile wide. Wilson was only a quarter-mile behind the storm -- so close, he could actually see the lumbering cyclone lose speed as it met the resistance of hills and trees. An approaching farmhouse proved to be no match; the tornado demolished the Royer family residence just outside the town of Haven. Wilson pulled into the drive only seconds after the storm had passed and dashed for the house, dodging a minefield of tree branches, power lines, and an overturned tractor. He arrived to find one occupant crawling out of a back window. When Trooper Wilson finally turned to check the sky again, it looked as though the tornado had dissipated. But the voices on the car radio told him the twister was still out there. It was now going on quarter to five. Sgt. Alan Stoecklein had been monitoring Trooper Wilson's radio reports from his home in Haven, Kansas. When Stoecklein heard the storm was headed straight for town, he called Reno County dispatch and told them to blow the sirens. Fortunately, the storm skirted to the west and north. Now, it was Stoecklein's turn to chase the twister. Driving north on a blacktop road, Al Stoecklein quickly discovered one of the storm's most unnerving habits: every so often the tornado would veer due east, right into the path of his pursuing car. As big as the storm was, judging the exact location of the funnel itself was hard. The swirling vortex was shrouded in a dense curtain of heavy rain, hail, and dirt. On several occasions, Stoecklein had to stop suddenly to avoid driving right into the funnel. "It was raining real hard as it approached, " recalls Stoecklein, " and I was going real slow. I couldn't see very far. All of a sudden, I noticed the telephone poles ahead of me were snapping off. One of the poles had a transformer on it, and I could see electricity arcing into the clouds. Then I saw tree limbs and wood up in the air quite a ways, and they were circling around. I knew then it was the tornado." There was never any doubt that this storm was dangerous in the extreme. The network of civilian and law enforcement storm spotters was working in high gear, and all lines of communication were wide open. People in the storm's path were getting ample warning, at least 20 minutes in most cases. The storm's size and slow speed made it easy to follow, and its path predictable. But sometimes, warning isn't enough. 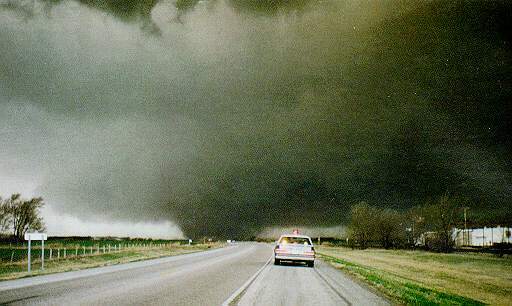 The Hesston Storm would claim two lives on this day, the first near the town of Burrton, Kansas. The tornado struck a rural farmhouse and collapsed the chimney and fireplace, sending a deluge of bricks into the basement. Six-year old Lucas Fisher was killed instantly as he huddled with family and neighbors. Near full strength, the tornado churns along US-50 towards Hesston, KS. At 5 p.m., a ringing telephone broke the din of the TV and the scanner at Sgt. Chip Westfall's home in Newton, Kansas. It was Harvey County dispatch, "calling all cars" as deadly peril approached from the southwest. The sky in Newton was getting very dark. Radar on TV showed the tornado approaching the county line, 18 miles away. The storm would be here in twenty minutes, maybe less. Westfall sent his wife to pick up their son at the county fairgrounds, along with with instructions for the 4-H leader to send the other kids home. Westfall sent his other son to the basement, changed into his uniform, climbed into his patrol car, and headed west on U.S. 50. "When I cleared the west edge of Newton, I could see the main storm cloud ahead," says Westfall. "When I topped the plateau west of town, I could see the tornado eight to ten miles away." Trooper Bob Harsh was already behind the tornado, chasing it east along U.S. 50, and snapping pictures as he went. "It was so odd," says Harsh, "if you were within a quarter mile of the tornado, that's where you would hit the real hard rain and heavy hail. As soon as you moved behind it or off to the side, it was clear. It was almost like you could drive right up beside it because there wasn't any rain." Meanwhile, Sgt. Westfall had turned north off U.S. 50 at Halstead, Kansas. Westfall drove about three miles and pulled over so the storm would cross the road about a mile in front of him. He knew from experience that he had to keep his distance. Years before, when Westfall was a McPherson County sheriff s deputy, a fellow officer had gotten too close to one tornado. A drastic change in air pressure actually shut down the car's engine. Again, the tornado turned sharply east, forcing Westfall to scramble for safety. "I didn't want to take the time to turn around," says Westfall, "so I just backed down the highway about half a mile to get away from it. And then chunks of ice -- not hail, but chunks -- started falling. It was like someone was chipping them off a block. They were kind of flat shaped, probably anywhere from the size of a golf ball to bigger than a softball." As Westfall and Harsh tracked the tornado, they saw something that few storm chasers witness. The tornado repeatedly regenerated -- shrinking down to a quarter-mile diameter, with sudden surges back to half-mile or three quarter-mile diameter. It was the kind of storm that was so strong, it was actually self-sustaining, according to Randy Steadham, the meteorologist at Wichita Weather. "Normally, tornadoes will develop and then move away from their support," says Steadham. "This tornado was getting continuous support. It fed on a constant supply of moisture that just kept it going." The tornado was now on a more easterly path, and moving straight towards Hesston, Kansas, a town of 3200 located just off I-135. Sgt. Westfall called Newton County dispatch and told them to blow the sirens at Hesston, and at two other towns within the tornado's reach. Back at Troop F Radio, Charlie Steadman could hear the excitement rising in Chip Westfall's voice as the storm churned closer and closer to Hesston. Westfall had to keep his car windows rolled up so he could be heard over the roar of the tornado. By 5:37 p.m. the sirens had already blown three times in Hesston. Unfortunately, loud sirens do not ward off tornadoes like evil spirits. Chip Westfall drove into town only minutes ahead of the twister to find the streets deserted. The only other moving vehicle in sight was an ambulance. There was nothing else to do now, but to get out of harm's way. "It took forever for the storm to get to Hesston," says Westfall, "and it felt like it took forever to go through." Troop F's radio logs show the tornado hit Hesston at 5:41 p.m. At 5:49, Sgt. Westfall reported major damage. Ambulance and emergency crews swung into action immediately. There were more than a dozen injuries in Hesston, three of them serious. But there were also zero fatalities, a testament to the dozens of spotters who had chased the storm, and to the communications network that got the warnings out. The storm cell would continue to spawn large tornadoes for another hour. The last would occur in the area of Council Grove, Kansas, some 120 miles from where Trooper Bob Wilson had watched the birth of the first twister. Kansas tornadoes are both legendary and commonplace, but this big twister was the talk of the Sunflower State for days to come. Front-page pictures were featured in newspapers statewide, and clips of a Wichita TV station's live coverage of the storm were shown on CNN's Evening News. Meteorologist Randy Steadham: "We did a survey the next day and talked to some farmers -- Kansas farmers who have seen tornadoes all their lives. One of the common statements I heard was they didn't know what it was. It was like nothing they had ever seen." Sgt. Chip Westfall: "I kept thinking it was going to lift up and so did everyone else. When I first saw it, I knew it was a 'killer tornado' . . . no doubt about it." Charlie Steadman, Troop F Radio: "What was fascinating to me was listening to the descriptions of the storm, and all of the officers were saying the same thing, 'it's big, and it's on the ground.' I could tell just by listening to their voices this wasn't an ordinary tornado." Trooper Bob Wilson: "I just couldn't comprehend anything this big and uncontrollable, and I felt so helpless. In a breaking situation, everybody's thinking 'well I can do this, I can do that'. You've got some idea how to respond to things. With this, you're facing a great big, unbridled monster of nature, and there's nothing you can do but get the hell out of the way." The Author and Tpr. Bob Wilson meet at the 1991 National Police Insignia Show in Kansas City. After interviews with witnesses and a survey of storm damage, experts concluded the Hesston tornado was actually a series of storms. They also concluded the tornadoes produced were among the strongest ever recorded. Jeff Herzer was a member of the Missouri State Highway Patrol Communications Division from 1987 to 2000. This article appeared in the Summer, 1990 edition of The Missouri State Trooper.